I is for... Insectoids. These neon bug-based Space sets from the 90's had the same camp as Starship Troopers -- but sadly did not include Neil Patrick Harris minifigs. I is for...Ice Planet. Before there was Hoth, there was this space sub-theme that debuted last decade and came back in 2002. I is for...Impulse sets. Otherwise known as me sets -- these are small sets (usually a minifig and a set piece/small vehicle) that are less than $5. In a hobby/obsession/pursuit like LEGO fandom, the concept of impulse control is one that is lost on most of the participants. 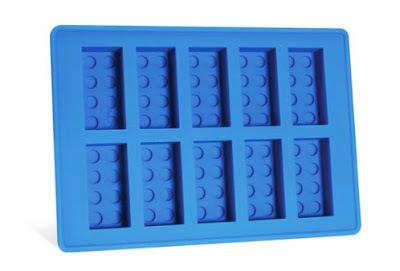 I is for...Ice Cube Tray. Man needed a better ice cube. LEGO delivered on that promise with a silicone mold that offers up bricks with studs. You shouldn't play with your food, but drinks are now officially in play. Is is for...Indiana Jones. This is the minifig (which debuted in 2008) that made me understand the allure of collecting minifigs. The coolest guy to ever rock a messenger bag.